Our guest walks us through the specifics of a case study on a non-performing note transaction where he used part of his own $20,000 home equity line of credit to to buy $33,000 worth of debt for just $6,000. Then explains how he used a collateral assignment to more than double his investable cash, and finally he describes the exact dollars and exit strategy for this transaction. I know we’ve had a run of guests who are investing in 2nd position non-performing notes and even if you’re not interested in that type of debt there’s something to be learned from the strategies that they employ to make sure they see a return on their investments. If you’re not already an active investor in notes or specifically non-performing notes, getting started with second position non-performing can be attractive because the amount of money needed to get started and that you ultimately have at risk is rather small if you’re buying one-offs, and we’ve now introduced you to at least 3 places you can buy these if you’re not interested in doing the work of sourcing them yourself. 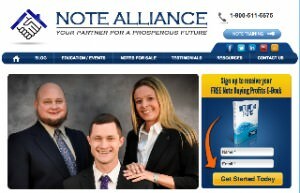 In this interview I talk with a partner at Note Alliance, Bill McCafferty. There’s a lot you can learn in here and it lasts almost an hour so grab your pencil and paper or fire up Evernote and get ready.